Facial recognition is certainly not a new technology, as Android users saw it appear for the first time with Android 4.0 Ice Cream Sandwich. It is clear, however, that it has made its way as a technology and has diversified into many various forms. In this article I’ll give you an overview of the most famous examples of how it’s currently used. The end of 2017 and the beginning of 2018 have led the mobile industry to follow new trends. We’ve seen the bezels on smartphones shrink and almost disappear and we’ve witnessed the increasingly advanced use of artificial intelligence with the simultaneous appearance of some new chipsets. Another one of the trends that came about at the end of last year was the introduction of more advanced versions of facial recognition such as Apple’s FaceID. I would prefer manufacturers to compete with another to extend the battery life of smartphones. As has often occurred in the history of Apple smartphones, Apple has decided to take a technology that already existed, redesign it and refine it and then adopt it on its new devices. And as we have already seen, all the Android manufacturers have decided to follow the trend by adopting the same functions, in order to profit from all the buzz generated by Apple. But how do these facial recognition technologies work? There are different variations and today we’ll see how they work according to their different characteristics. In my opinion, LG uses the simplest but most effective version of simple facial recognition. The dedicated software records an image of the user through the front camera, and as it acquires biometric data, it asks the person to nod and rotate their head left and right to capture as much data as possible. The unlocking is performed in the most intelligent way among all the techniques described in this article: just pull the smartphone out of your pocket or lift it up from the table and place it in front of your face to unlock the device. This is certainly not the safest implementation of the technology, but it is certainly the most convenient. You don’t have to press the release button and no interaction with the display is required. You can hide the content of your notifications until the device recognizes your face, but you can’t watch notifications come in from the lock screen. This feature is available on the LG G6, Q6 and V30 smartphones. Huawei’s sister company in China introduced face recognition for the first time on the Honor View 10. The function was then also recently introduced to the Honor 7X through an update. Honor’s first implementation of facial recognition was somewhat peculiar, to put it nicely. At first the technology was only used to show the contents of notifications in the lock screen (that were otherwise hidden), but didn’t actually unlock the smartphone. A PIN or fingerprint scan was still needed to unlock the device. With the latest software update the recognition technology has finally become useful because after recognizing the smartphone’s owner, the technology allows you to unlock the device directly or through a swipe, without a pin or password. You can choose to turn on the display and start recognition automatically as soon as you lift up your smartphone and point it towards your face, similarly to what you do for LG or Apple. 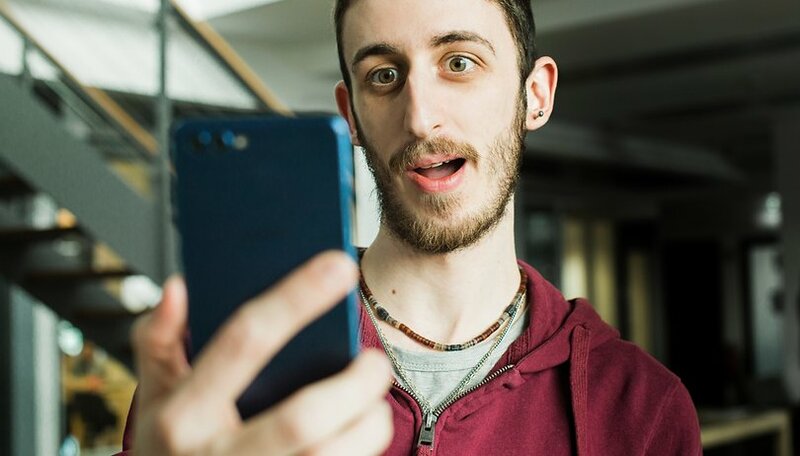 OnePlus introduced unlocking via facial recognition on the OnePlus 5T and then made it available on its predecessor models, the OnePlus 5 and 3/3T. OnePlus’s procedure is also simple, as the appearance of your face is detected via the front camera and the scan is recorded offline on your smartphone. Each time you unlock your smartphone, it uses the front camera for recognition, comparing the original scan to what the camera sees. Unlocking usually occurs immediately when the power button (or through a double tap on the off display) is pressed quickly and accurately, but you can change the settings so that after detecting the user’s face it will require a swipe on the screen to unlock. This is useful if you just want to read notifications without unlocking the device. There is also a function that illuminates the screen to allow for better facial recognition in low lighting conditions. Samsung uses facial recognition technology that is very simple and similar to Android stock software. During setup, your smartphone will ask you to be at a distance of about 20 to 50 cm from your device so that it can scan your face. Unlocking is fact enough, but requires that you press the unlock key to turn on the display and start the recognition procedure. As an alternative to this insecure unlocking method (a photo or video can deceive the system) your smartphone allows you to also use the iris scanner. Samsung is the only manufacturer that currently uses this technology on its smartphones, but I personally find it slow and unreliable, despite the fact that according to company it’s much more reliable than reading your fingerprint. It’s also really difficult to position your device at the right distance and angle for the scanner to work. The function is available on the Galaxy S8, S8+ and Note 8. The iPhone X is the only smartphone from the Californian company that has this feature. The smartphone, designed to celebrate the tenth anniversary of the device that has changed the world, features an array of sensors located in the upper part of the display inside the so-called notch. The most important sensors required for the facial recognition are the IR beam projector and the infrared camera. Thanks to Apple’s IR emitter, the iPhone X is able to project thousands of infrared rays toward the user that allow the camera to create a 3D model of your face by measuring the distance traveled by each beam before they hit your face. The scan is really precise and effective and mainly takes into account facial features and the relative position of your eyes and nose. This choice has proven to be successful in everyday use, as the iPhone X can even recognize its owner after a change in hairstyle, facial hair (especially relevant for me) or if you’re wearing a hat, headphones, or a scarf. Furthermore, it makes this type of facial recognition the safest ever seen on a smartphone thanks to the precise information detected through 3D scanning. The smartphone’s display can be turned on independently thanks to Rise to Wake and recognizes the user’s face in a fraction of a second, even in the dark. The facial recognition only serves to reveal the content of notifications (otherwise hidden) and unlock your smartphone, meaning that the iPhone understands it’s in the hands of its owner. The actual unlocking to reach the home screen is done with a swipe from below. What is the best method for unlocking with face recognition? The answer to this question depends on what a person is expecting. For example, unlocking with LG’s face recognition is extremely convenient. You don’t even notice that you’ve enabled it, and your smartphone turns on and unlocks the exact moment you position it in front of you. It can, however, be unsafe and easy to circumvent. The same can be said for Honor and OnePlus. Although they are better implemented, they don’t have a system that is any safer than the fingerprint reader, which is now universally accepted and used. Samsung has taken an important step in this field and the iris scanner provides some certainly for those who are really concerned about the security of their data. It is perhaps the most uncomfortable and slowest-functioning implementation of facial recognition, but at the same time it is also safer. Apple currently has the most advanced facial recognition system with the creation of a three-dimensional model that evolves over time as the user’s appearance change. Even in terms of security, the system is more advanced than its predecessors, and the recognition speed makes it usable in everyday life without too much stress, unlike Samsung’s iris scanner. But we shouldn’t forget that Honor (meaning Huawei) has already announced that they are working on an Apple-style three-dimensional recognition system and Samsung is preparing to present the new Samsung Galaxy S9, which should have an improved iris scanner in terms of speed and precision. LG also seems to be working on an iris scanner that would raise the security level of its smartphones. But now we’d like to hear from you! Do you use facial recognition to unlock your device? If so, on which device do you use it and how has your experience been with it so far? I use face recocnition on my Huawei P20 pro and it works like a charme. I'm pretty impressed and as you wrote, I don't even notice the procedure. I just take the device and it turns on, already unlocked. It even works in the dark and in almost every situation. But sometimes it won't, but it's ok. One time I had an issue and I figured out that the front camera crashed (black screen in front camera mode). After a reboot it worked again and it happed only once. I'm really happy with that function!